Bonjour, my friends! After three planes, a train and a bus, we finally made it to Paris around noon today (or about 3 a.m. your time! ), and promptly took a five-hour nap in our hotel after being up for approximately 22 hours (eek!). Then we showered, strolled down to a local restaurant for dinner, sipped some wine and finished the night with coffee and a ridiculously delicious chocolate mousse with orange zest, followed by a nighttime stroll around Montparnasse. Now we're feeling right on track! And, apparently, some of the best creperies in the city are in this district near the Gare de Montparnasse, so the only things we have planned for tomorrow (so far) are patronizing one of those, then taking some advice from Funny Face, one of my favorite Hepburn movies, and going to see the Eiffel Tower first thing. 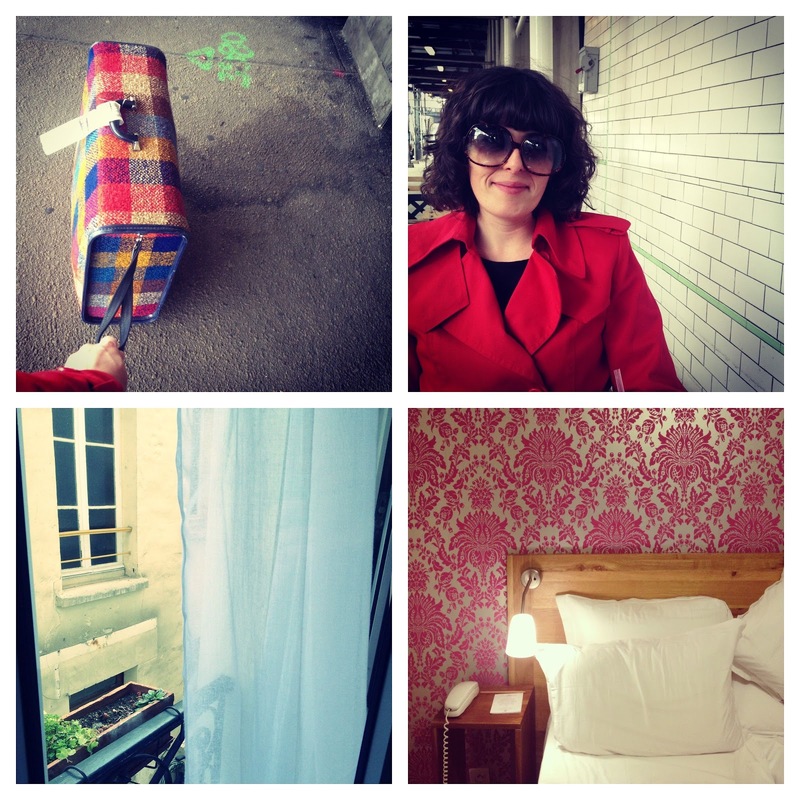 Above is a little collage of snapshots from our first day (although technically two, I guess): the top from New York and our lunch at Pastis, and the bottom two from our hotel room (don't you love the wallpaper?). Well, I'm eating a swiss cake roll...so there... Seriously, gorgeous. So fun! Excited to see more photos! I almost sold an awesomely obnoxious pink flocked shower curtain just like that wallpaper in my booth today, but alas the buyer decided her bathroom pink was too much on the coral side. Enjoy Paris (Funny Face is one of my Faves as well)!